ALL ABOARD! Enjoy Gordon MacRae and his guest stars as they perform some of the greatest musical selections from famous plays and operettas. 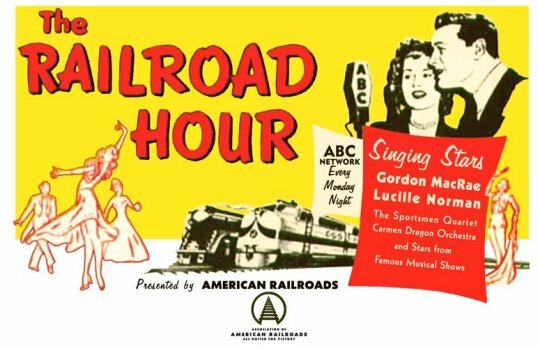 The Railroad Hour was on the radio from 1948 until 1954, first on the American Broadcasting System (ABC) and moving to the National Broadcasting System (NBC) in 1949 where it stayed until the series end. It was on the air Monday nights at 8:00 p.m. Eastern time on both radio networks. Gordon MacRae was the star with various guest stars performing each week, usually a well-known female star of the era such as Jane Powell and Doris Day. 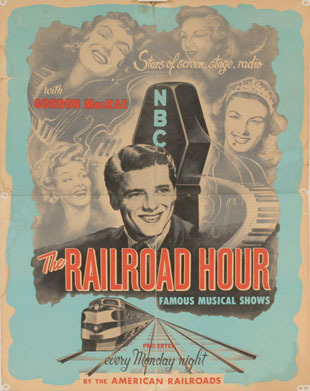 The show opened each week with the theme song, “I’ve Been Working on the Railroad”, which is very appropriate for a show sponsored by the Association of American Railroads.